No matter where you choose to celebrate Christmas this year (of course, we think Carolina Beach is the best place) there is no reason you can’t bring your love of the beach with you. From inspiring gifts, seafood and coastal decor, this week we have everything you need to have the ultimate beach inspired Christmas. Perhaps the easiest way to bring a little beach to your Christmas is to book a beach vacation. There is still time to book a great vacation on Pleasure Island. We have a large inventory of beautiful homes to suit almost any size gathering. All of our homes are well maintained, have great amenities and features some of the best locations in the area. No matter which vacation home you choose, we guarantee you will have a unique and memorable Christmas vacation here on Carolina or Kure Beach. Want to get started planning your holiday beach vacation? Give us a call today at 888-256-4804today! We hope to see you on Carolina or Kure Beach this holiday but if you can’t make it, why not bring a little bit of the beach into your home. How? 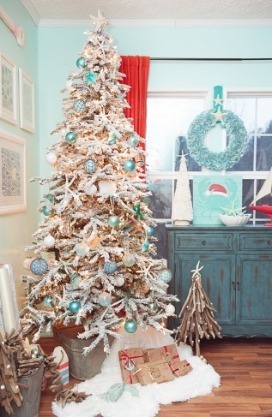 Easy, by adding touches of the coast into your decorations. There are all sorts of decorations to choose from. Some can be purchased, and others are perfect for the DIY fan. Here are three that we love. All of the directions and things you’ll need to make these can be found by clicking here. One easy way to enjoy a little beach inspiration during Christmas is to bring a little bit of the beach to the dinner table. Of course, here on Carolina Beach that can only mean one thing… fresh seafood!All along the North Carolina coast you’ll find great fresh seafood especially fresh shrimp. For those who love fish, you’ll discover fresh tuna. Mahi-Mahi, snapper, and flounder among other local favorites. The easiest way to enjoy this food is to book your Carolina or Kure Beach vacation (click the button below to begin) where you’ll find great restaurants and seafood markets. But, if you can’t make it to Carolina Beach this holiday you can still incorporate these and other fresh seafood into your holiday celebration. Here are three great recipes you might like to try. 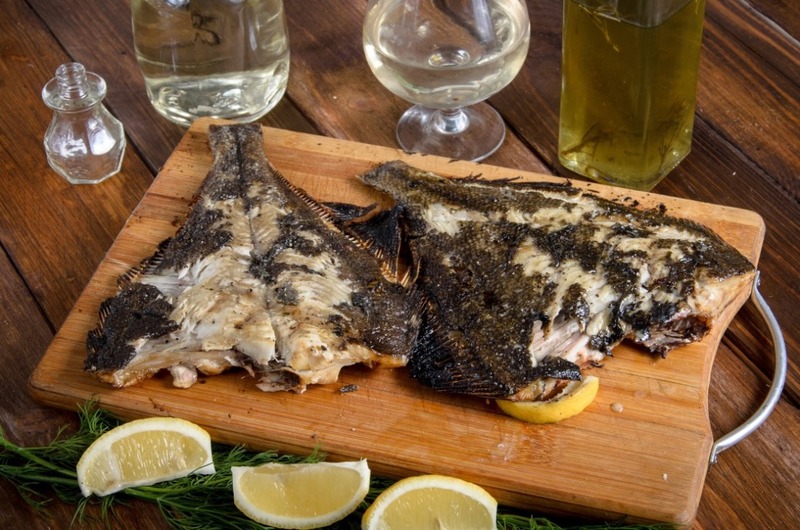 One of the easiest ways to prepare fresh fish is by grilling. Luckily, here on the North Carolina Coast even in December you’ll likely have great weather that is perfect for firing up the grill. If you are looking for an easy dish (and an excuse to use the grill at Christmas) then this simple recipe is for you. Flounder is easy to prep, cooks quick and with it’s light flavor, it is a great fish to serve to a large gathering. Click here for the recipe. What is fall without a warm bowl of savory and rich soup? Well if you are a soup fan, here is one of three great soup and stew recipes we have for you. This one is a twist on an old classic that includes one of our favorite ingredients… fresh shrimp. Give this Fisherman’s Soup a try on a cool evening. Fresh crab is an institution here on Pleasure Island. Many locals and visitors alike enjoy crabbing along our waterways. Now you too can bring some fresh crab dip to the dinner table. This dish is a great appetizer with its warm and savory flavors. The Nature Conservancy is the world’s leading conservation organization, fighting to protect both nature and people. The organization commits resources to things like beach cleanups, land preservation, and education. One of its major goals is to teach people about the benefits of keeping our oceans clean. The Nature Conservancy offers many ways to get involved and joining/supporting them is a great gift. Learn more at nature.org. Founded by Entourage star, Adrian Grenier, and co-founder, Lucy Sumner, the Lonely Whale Foundation’s mission is to spread awareness about ocean health and the well being of marine wildlife. The Foundation has started the #StopSucking campaign to educate people about the perils of one-use plastic straws in the ocean, and ultimately to stop using them. If you love the ocean and/or whales, this is the perfect gift for you. Learn more at lonelywhale.org. Since 1984 the Surfrider Foundation has been fighting to protect our oceans and beaches. The foundation achieves this by supporting water quality testing, community partnerships, beach cleanups, and more. For every dollar donated to the foundation, 84 cents directly funds programs and campaigns to protect the coast, while the rest goes toward generating future donations and covers operating costs. Since its inception, The Ocean Conservancy has focused on long-term solutions designed to ensure the planet has healthy oceans, wildlife, and coastal communities. Current programs include supporting sustainable fisheries, working to combat ocean acidification, and restoring the Gulf of Mexico. For over 30 years the Ocean Conservancy has been hosting the International Coastal Cleanup, which brings together millions of volunteers to remove trash from beaches around the world. Donate and learn how to get involved at oceanconservancy.org. There is still plenty of time to book your Pleasure Island beach vacation. All you have to do is pick up the phone and BOOK DIRECT AND SAVE with Victory Beach Rentals! Don’t pay extra traveler’s fees… BOOK DIRECTLY with Victory Beach Vacations where we guarantee the lowest rates on our properties! Many outside sites charge TRAVELER’S & SERVICE FEES. Please be sure to book through our website or call our reservationists at 888-256-4804. Join to receive special offers and new discounts.